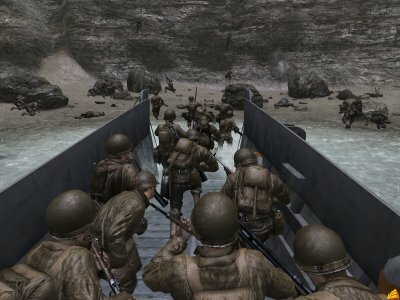 One of GN's spy pirates has learned that an upcoming entry in Activision's Call of Duty series will be the first third-party FPS title released using the unique capabilities of the Nintendo Revolution controller. The "Revmote" features a wireless motion detecting interface that has long been speculated to be a perfect fit for the analog aiming controls of a first-person shooter, and gamers can look forward to putting this to the test when Call of Duty ships for the Revolution as a launch or "launch window" title. The Revolution version of the game is being handled for Activision by Exakt Entertainment, the Santa Monica-based console conversion specialists who are well versed in adapting third-party titles for Nintendo platforms. Exakt previously produced GameCube ports of X-Men: Next Dimension, True Crime: Streets of L.A., as well as... 2004's Call of Duty: Finest Hour. While most of us expected this to happen, its nice to hear none the less. Call of Duty is one of the most respected series on the market.